The Nissan Cima (Japanese: 日産・シーマ Nissan Shīma) is a large full-size luxury sedan produced by Nissan Motor Co., Ltd. for the Japanese market. The car's name is derived from Spanish for "summit". The hood ornament uses an image of an acanthus leaf. The acanthus leaf was commonly used by classical Greeks to make a wreath for use as a crown. In Japan, the Cima has traditionally been Nissan's rival to the Toyota Crown Royal Saloon G and later Majesta. The Cima in the first two generations was a more luxurious and larger version of the Cedric and Gloria, with the Cima sharing the V8 engine from the earlier flagship Nissan President, Nissan's alternative to the Toyota Century. The Nissan Cima was introduced in 1988 and was based on an elongated Cedric/Gloria chassis. With its phenomenal sales—about 64,000 units sold the first year and 120,000 in four years—the car became a symbol of the "bubble economy". The Cedric Cima was sold at Nissan Motor Stores, while the Gloria Cima was sold at Nissan Prince Store. Later generations of the Cima shared the same platform as the President, with the Cima being a shorter version, thereby allowing Nissan to continue offering the Cima at Nissan Prince Store locations. The later iterations of the Cima were exported to the United States as the Infiniti Q45. The Q45 was discontinued after 2006, however the Cima and the President continued in production until August 2010, leaving the Nissan Fuga to become the lone flagship. April 2012, the Cima name was resurrected, and resumed "flagship" status in Japan as a longer wheelbase version of the Fuga. Up until 1989, the Japanese tax bracket dictated a division point at the car being 4,700 mm (185.0 in) long, 1,700 mm (66.9 in) wide, with a 2-liter engine. Both the Nissan Cedric/Nissan Gloria and its arch-rival, the Toyota Crown were stretched to this very limit. When rumors came that Toyota was developing a larger, wider extension of the Crown, called the 4000 Royal Saloon G, Nissan acted hastily and could not get the wide version ready for the narrow version's launch in June 1987. The half-year gap in development, however, brought about many changes in design. This generation was manufactured as a 4-door hardtop, with no B-pillar between the front and rear side glass windows. The Y31 Cima is available with a 200 hp (149 kW) VG30DE or a 255 hp (190 kW) turbocharged VG30DET. The turbocharged version was especially popular, leading the Japanese media to coin the term "the Cima phenomenon". The Cedric Cima was sold at dealerships Nissan Motor where the Laurel could be found in Japan, and the Gloria Cima was sold at Nissan dealerships Nissan Prince that sold the Skyline. The Cima was available with an electronically controlled air suspension and a center console color CRT-display for vehicle functions. Following the Y32 Cedric/Gloria's June 1991 launch, the Cima was redesigned and introduced in August 1991. The car is now simply known as the Cima, and remained the flagship offering at Nissan Prince Store locations alongside the Nissan Skyline and Gloria. Later in the year, Toyota launched the independent Crown Majesta competing with the sport-oriented trim levels. The collapse of the Japanese asset price bubble resulted in lower sales for either car, compared to Nissan's previous Y31 model and Toyota's S130 model Crown Royal Saloon G.
Initially the Cima was only available with the VH41DE, a short-stroke version of the VH45DE found in the first Infiniti Q45. The air suspension introduced in the previous generation was retained along with Full-Active Suspension that was available on the US-spec Infiniti Q45. Its appearance was said to reflect a more British appearance, both inside and out. An analog clock, found on most US-spec Infinitis during the same time period, also appeared in this vehicle. AWD and a V8 engine were also added to the options list. Unlike the previous, Japan-only models, this third-generation Cima was sold overseas—as the new Infiniti Q45. However, instead of the VH45DE engine, Nissan chose to continue using the VH41DE. In 1999, the Cima was exclusive to reorganized Nissan Japanese dealerships Nissan Red Stage, while the President was now exclusive to Nissan Blue Stage locations. This generation was made available as the US-spec Infiniti Q45. AWD was still being offered in Japan only and it was the first car sold in Japan with side airbags as standard equipment. The styling seemed to resemble Mercedes-Benz vehicles sold at the time. This generation vehicle was used as a patrol car for the Saitama Prefectural Police Highway department. The primary competitor for this version is the Toyota Crown Majesta which also has a V8 engine. As this generation was sold at Japanese Nissan dealerships next to the Nissan Skyline, the Cima was given a performance-car appearance to capitalize on the popularity of the Skyline. In 1999, the Cima became the first Nissan with laser adaptive cruise control. The fourth-generation Cima arrived in January 2001. The timing was early in the Nissan Revival Plan, so the Cima did not have the Skyline's FM platform. Instead, it features an updated version of the old President platform, with a new rear suspension. However, Nissan's new design identity was thoroughly worked into both the exterior and interior. This Cima became known for its unique 7-reflector headlights. The Cima was sold in the US as the Infiniti Q45. This model continued to be Nissan's rival to the Toyota Crown Majesta, and also competed for customers for three years with the Japan only Mitsubishi Proudia, however Mitsubishi chose to use front wheel drive. The new VK45DD direct-injection V8 features in the Japanese Cima, alongside the VQ30DET, both producing 280 hp (209 kW). The V8 in the Infiniti version produces 340 hp (254 kW). A BOSE sound system was offered in June 2002. A LHD version of this generation was offered for sale in China at the Shanghai Auto Show in April 2003. Due to tightening emissions restrictions, the turbocharged vehicle was no longer offered on the V6 engine starting July 2005. The Infiniti Q45 was no longer exported to the US after MY 2006. This generation of the Cima is very similar to the Nissan President. In August 2010, Nissan announced that it had stopped the production of both the Nissan Cima and President, which share the same chassis. The two models needed safety upgrades to comply with the latest safety regulations, but lackluster sales showed that the company would not be able to recoup costs. 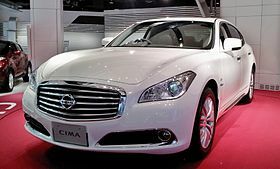 In light of Nissan stopping development on a Cima/President successor, the Nissan Fuga has become the flagship in its lineup. When the Fuga assumed the role as flagship sedan of Nissan Japan August 2010, it became the first time that Nissan didn't sell a premium luxury V8 sedan in Japan; the Fuga's North American cousin, the Infiniti M56, is offered with a V8 shared with the Infiniti QX56. Nissan revived the Cima nameplate as the long wheelbase version of the Nissan Fuga Hybrid. Instead of a V8 engine, the new Cima is now a hybrid sedan equipped with the 3.5L V6 hybrid VQ engine with maximum power of 225 kW (302 hp; 306 PS) at 6800 rpm and maximum torque of 350 N⋅m (258 lbf⋅ft) at 5000 rpm) with an advanced ‘HM34’ electric motor with maximum power output of 50 kW (67 hp; 68 PS) and maximum torque of 270 N⋅m (199 lbf⋅ft) and high-output lithium-ion battery with a quick charge/discharge function. It also comes with Nissan's "Intelligent Dual Clutch Control", a one-motor two-clutch parallel hybrid system, that offers direct response, superb driving feel and low fuel consumption. Sales of this flagship hybrid sedan in Japan began May 21, 2012. It is a resurrection of a 1960s and 1970s styling trend called "coke bottle styling". 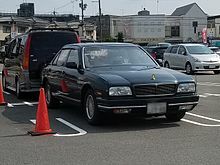 The reintroduction of the Cima to Japanese customers was done to offer an alternative to Toyota's limousines called the Century and the Crown Majesta which the Cima is now the direct alternative. On April 16, 2014, it was announced that the current Cima will be offered in North America as the Infiniti Q70L beginning with the 2015 model year. Mitsubishi Motors sells their own version of the Nissan Cima Y51 under the Dignity name and sales of the Nissan Cima-based Dignity started April 26, 2012 until November 30 2016. ^ "Grade List for Nissan Cima". carfomjapan.com. Retrieved 2017-10-25. ^ Aoyama, Y.; Kawabata, K.; Hasegawa, S.; Kobari, Y.; et al. (September 1, 1990). "Development of the Full Active Suspension by Nissan". SAE.org. SAE International. doi:10.4271/901747. Retrieved May 13, 2016. ^ Inoue, Hideaki. "Autonomous Driving: Creating a New Relationship Between Humans and Cars". On the Research Front Lines. Nissan Research Center, Nissan Motor Corporation. Retrieved May 13, 2016. ^ "Nissan Releases All-New Cima". ^ Turkus, Brandon. "Infiniti Q70 adds long-wheelbase model, fresh looks for 2015". Autoblog.com. Retrieved April 17, 2014. ^ "Mitsubishi Dignity New 2016 Model Export from Japan". batfa.com. Batfa Japan Inc. Retrieved May 13, 2016. Wikimedia Commons has media related to Nissan Cima.